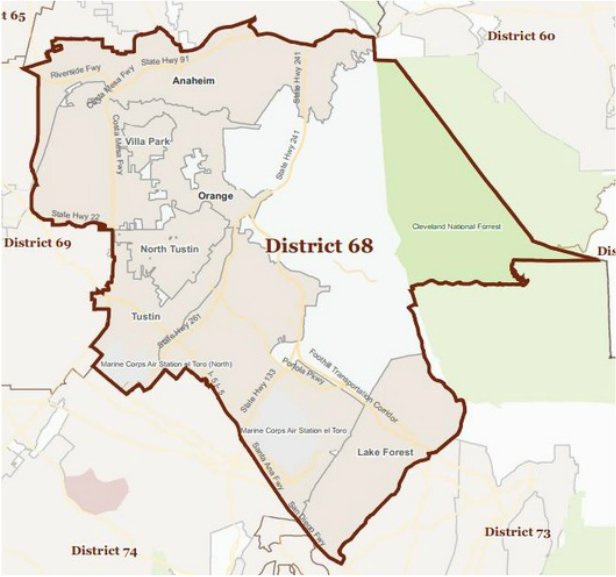 Republican Don Wagner currently represents Assembly District 68 and will be termed out in 2016. Wagner is running in a special election for Senate District 37. If Wagner were to win, this will become an open seat and a special election will take place in late 2015. First elected in 1998 to the South Orange County Community College District Board of Trustees, Don served three consecutive terms, including an unprecedented six years serving as Board President. Under Don's leadership, his district balanced every budget and paid off all its debts, without raising taxes. A practicing attorney, Don is active in the Orange County business and legal communities. He has served on several committees or advisory boards for the Orange County Bar Association and as a Judge Pro Tempore in the Superior Court of Orange County. He has also published articles on legal, political, and cultural topics in the local media. Don is committed to his community and is actively involved in several non-profits and charities. He served as president of the American Lung Association of Orange County, an affiliate of the nation's oldest voluntary health organization. He founded and served as the first president of the Orange County Chapter of the Federalist Society, a national organization of conservative lawyers, judges, and law professors committed to ensuring a judicial integrity and strict adherence to the Constitution of the United States. Don is also a past finalist for the Irvine "Citizen of the Year" award. Don received his bachelor's degree in English from the University of California, Los Angeles. He earned a Juris Doctorate in 1987 from the University of California, Hastings College of Law, and was admitted to the California Bar in the same year. In the Assembly, Don was appointed to serve on the two key fiscal committees, Appropriations and Budget, where he sits on the Sub-Committee 4 that addresses state administration. He is proud to serve as both Vice-Chair of the Assembly Judiciary Committee and Vice-Chair of the Assembly Committee on Aging and Long Term Care. Don also serves on the Assembly Health Committee, and as the Deputy Republican Floor Leader. Don and his wife, Megan, reside in Irvine, where they raised their three children. All of the Wagner children were educated in the Irvine public schools, with which the Wagners have long been heavily involved in various types of volunteer work.